What is the Baimo Cave? Bama, the only world-famous longevity home in a subtropical region in Southwest China, is located 300 kilometers northwest of Nanning, the capital of Guangxi. Bama is also called Wangang, meaning hundreds of mountains. It is famous for its centerpiece, the Baimo Cave, not only famous for its karsts landscape and colorful Yao culture but also its extremely fresh environment known for detoxification and rejuvenation. Facing south, Baimo Cave rises over 100 meters. It is 70 meters wide and more than 4000 meters long. The Panyang River flows through and under the cave. Inside the caves, hordes of stalactites and stalagmites of various shapes and sizes mesmerize the tourists. The highlight of the cave is the giant hall in the first floor from where one can see the most spectacular limestone formations with fanciful names. All the caves, big or small are connected. Baimo Cave leads to Gansui Cave, Liuyang Cave and Wuren Cave. ​Baimo cave has three floors or layers. Its second and third layer has the most incredible limestone rocks, which compose spectacles with poetical names such as Royal Palace and Bewitch Land. 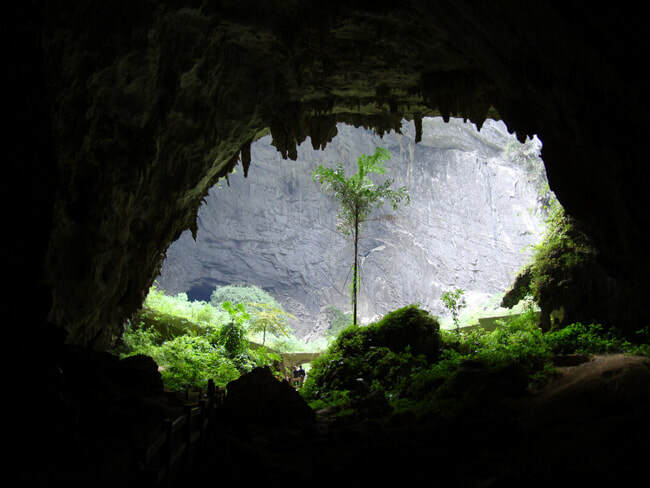 Sandwiched between South Cave and North Cave, is an almost hidden barren-shaped open-air cave. Serving as a giant air conditioner, it is best to explore the vast river passage in quaint boats with various stops for exploration on foot. It truly is a wonderland. Interested in visiting Baimo Cave on a Tour? Wendy Wei Tours offers a variety of different packaged tours as well as custom tours including the Baimo Cave, among other attractions and destinations. To find out more, please visit our Tours page or Contact Us directly to find out more.